Mouse On Mars is the quintessential 1990s electronic outfit. Like many of the groups that emerged during that time, the duo—which consists of Jan St. Werner and Andi Toma—is bent on the denial of categorization; it’s difficult to pin down what was so addictive about their early work, sown with gentle, free-flowing pads and synths. Over the course of their 25-year career, St. Werner and Toma have had a tendency to make friends of musical collaborators, and they’ve found their home on multiple imprints. This versatility and hunger for diversity has helped them avoid not only the spotlight, but also a boring pigeonhole. Since they formed the group in 1993, both members have left the west of Germany, resettled in Berlin and released a staggering 20 albums, including their most recent announcement, Dimensional People. In honor of the forthcoming LP, we took the liberty of sorting through their extensive and captivating musical catalogue to select some of their most important works. Make sure your pockets are full of cash for the record shop—or, at very least, that you’ve paid your Internet bill. Not long after the two met at a concert in Cologne in 1992, their mutual musical affinity led to this soft-textured exploration. As fans of the American instrumental group Seefeel, St. Werner and Toma figured that they’d send their demo to their home label, Too Pure. The British indie label eventually released Mouse On Mars’ debut album, Vulvaland. It also features the iconic single, “Frosch”. What follows is an entrance into the long-term experiment of space between sounds and notes. St. Werner once told Pitchfork that Vulvaland is one of the band’s shyest productions. But sometimes fewer words are more effective. The German duo took a long break after their 2006 release Varcharz on Ipecac Recordings. Six years later, their next Mouse On Mars project featured their first release on the Berlin-based label Monkeytown Records, the imprint of Modeselektor’s Gernot Bronsert and Sebastian Szary. Their new colleagues’influence was immediately apparent. While traversing more familiar elements of atmospheric electronic music, the album is also stamped with sounds of punchy analogue bass lines and tinged with acid and hip-hop. If St. Werner once felt as though his debut album was less than entirely expressive, the duo definitely made up for it on Parastrophics. Basking in the twilight of the ambient textures of the late 1990s, Instrumentals was the first release on Mouse On Mars’ own label, Sonig. While it was initially vinyl-only, St. Werner and Toma later joined forces with Thrill Jockey and Domino Records to distribute a CD version in 2000. The piece was produced during a prolific period for the duo. Elements of dub, atmosphere and nostalgia permeate throughout in a nod to the post-rave chill-out music of the decade prior. Through subtle tape hiss and analogue imperfection, it maintains one of the last traces of MoM’s signature warmth. Fans of this album will forever thank the director of Glam—which never made it to the silver screen—for not taking this soundtrack. Instead, Mouse On Mars’ rejected film score was released on wax via Sonig. It arrived during a fruitful period of progression, inventiveness and relevance for the niche electronic music industry of IDM. For MoM, it also signaled a goodbye to the more relaxed manner of music making that their previous identity had been rooted in. The characteristically atmospheric and submerged sounds of Glam would eventually disappear. Their ensuing work, Niun Niggung, would flirt more intensely with pop-sounding composition. After 21 years of making music together, Toma and St. Werner decided it was time to release a collaborative album. The sounds and styles on this release reach as far as the artists it’s comprised of. Encompassing more than two decades of direction and over 30 tracks, the album’s only uniting theme is its consistent variety. It’s an insight, however, into the duo’s desire to stretch their range, and the fun they have while doing so. Whether its the beats of Modeselektor, the fluidity of the Junior Boys’s signature groove or greetings in German by friends Ingrid and Oswald Wiener, the album is pleasantly disinterested with anything but having a good time. In the midst of significant changes in sound, recording technique and additions and collaborations, Idiology represents a relevant landmark in the journey of Mouse On Mars. The arrival of German drummer and vocalist Dodo NKishi paved the way for a long-term change and the addition of live instrumentation to the band’s production. St. Werner has referred to NKishi as a multi-instrumentalist pivotal to the band’s changing direction and introduction to digitized vocal explorations. NKishi’s poppy vocal presence is immediately detectable on thsi release, which provides a refreshing change of pace. For Mouse On Mars’ first live album, tracks were cut from appearances during their 2004 world tour for “Radical Connector”. Released exclusively on their home label, Sonig Records, Live 04 reigns in at just under an hour. It offers an interesting and appropriately imperfect insight into the band’s fluid and improvisational nature. With NKishi on drums and distorted vocals, Toma on bass guitar and St. Werner in control of the hardware, the three intertwine to form a lucid dream of electronic music. It’s not totally programmed and planned, but its also not entirely foreign. It remains in an ambivalent electronic limbo, but nevertheless remains intriguing and stimulating throughout. As the turn of the millennium threatened ominously, it became clear that Mouse On Mars was having second thoughts about which musical direction they were destined for. In evidence of this seemingly audible angst, the German duo made a point of having fun on the Thrill Jockey-released Niun Niggung, which is an exodus from their glitchy, introspective take on intelligent dance music on Instrumentals. Instead, the guitar licks on “Download Sofist” and the popping and bouncing on “Yippie” provide an accurate taste of St. Werner and Toma’s thematic indecisiveness yet undeniable carefree approach to crafting music that’s fun to make. Featuring the work of contemporary artists like Justin Vernon of Bon Iver, Zach Condon of Beirut and Aaron and Bryce Dessner of The National, Dimensional People is the culmination of what the band sounds like 25 years after its debut. Continuing their careers on an idea that many believe to be dated, their new productions appear matured and exciting. The juxtaposed yet fluid compositions are stripped back, a step back from the maximalist sensibilities that their other more recent albums showcased. EB.tv was even provided exclusive access into the album’s composition, which you can watch in a short documentary above. 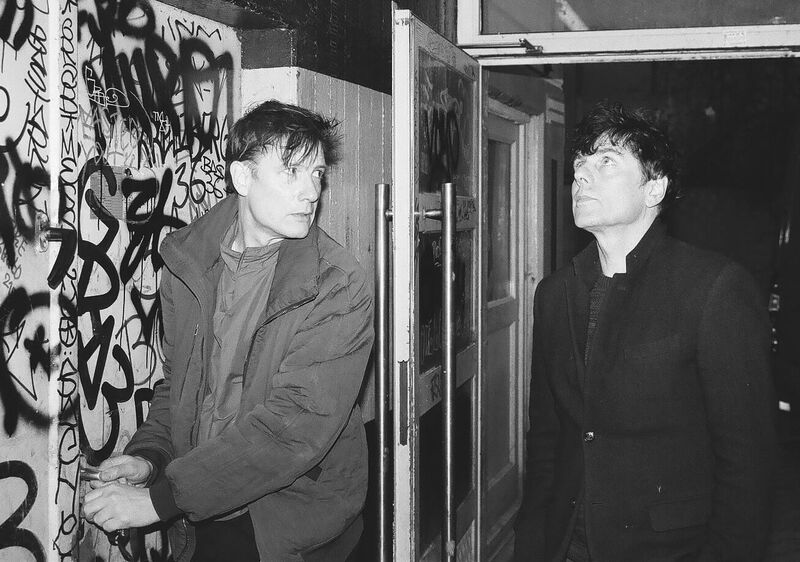 While St. Werner and Toma have collaborated with an almost endless list of artists, musicians and friends, perhaps no partnership is as strange than their full-length album with Mark E. Smith, the signer of The Fall, who died earlier this year. While Smith’s talking style of vocal work appears briefly on records prior to their collaboration, Tromatic Reflexxions, released on Domino records in 2007, is the first hint of what the sound conveys over the course of an LP. St. Werner and Toma have their music take an abrasive turn to parallel the relentlessness of Smith’s contribution. We’re not sure how we feel about this one, but we’ll just say that we’re glad that it happened.